It may not seem like almost two months since Aussie electro-rockers Cut Copy were carving up the tracks for “Fabriclive 29” but it most definitely is. 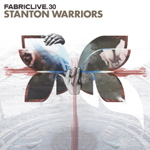 So, it’s time for “Fabriclive 30” which will this time be steered into the record stores by the breaks mad pair of Stanton Warriors. Dominic Butler and Mark Yardley not only operate under the name Stanton Warriors but have also been known to churn out the hits under the moniker Punks, like their retake of the early naughties Cosmos hit which they amusingly titled ‘Break Me With You’. More recently though their DJ talents were called upon by Richard Branson’s V2 label for the “Stanton Sessions Vol. 2”. Much like that recent mix CD their Fabriclive offering is compiled largely of their own original productions. However, the Warriors have spiced things up for the London clubbing brand with plenty of electro and house from the likes of Kerri Chandler and Booka Shade. "Fabriclive 30" will be released by Fabric on October 17.